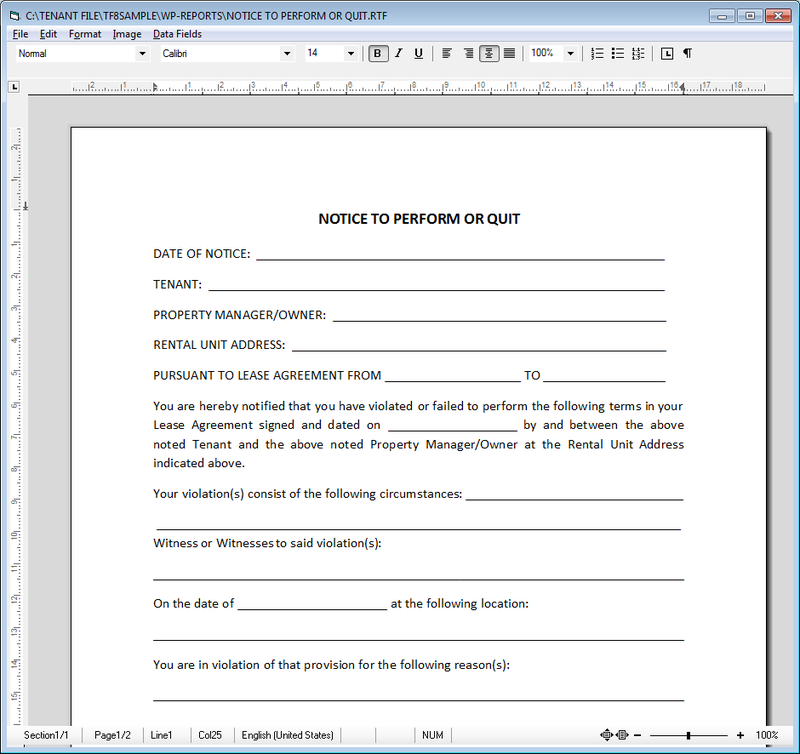 Over 100 PROPERTY MANAGEMENT FORMS! 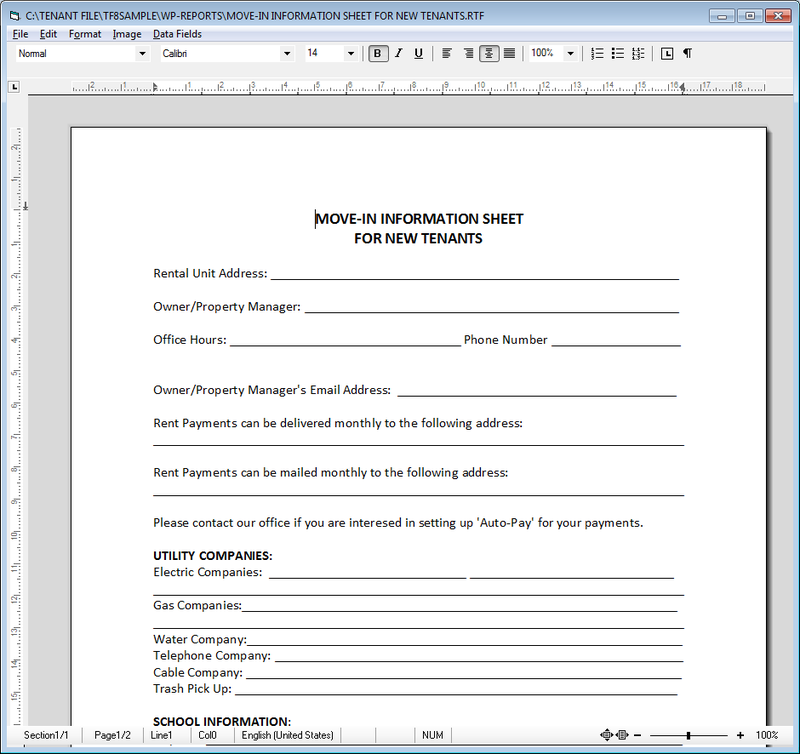 These forms are included in the Tenant File Word Processor! The single most important activity of a rental owner is what you communicate to your residents. With these forms, now you can take total control of every rental situation, generate more monthly cash flow, and save more of your valuable time! Comes ready with a built-in Word Processor, and all forms can be easily tailored to your needs! 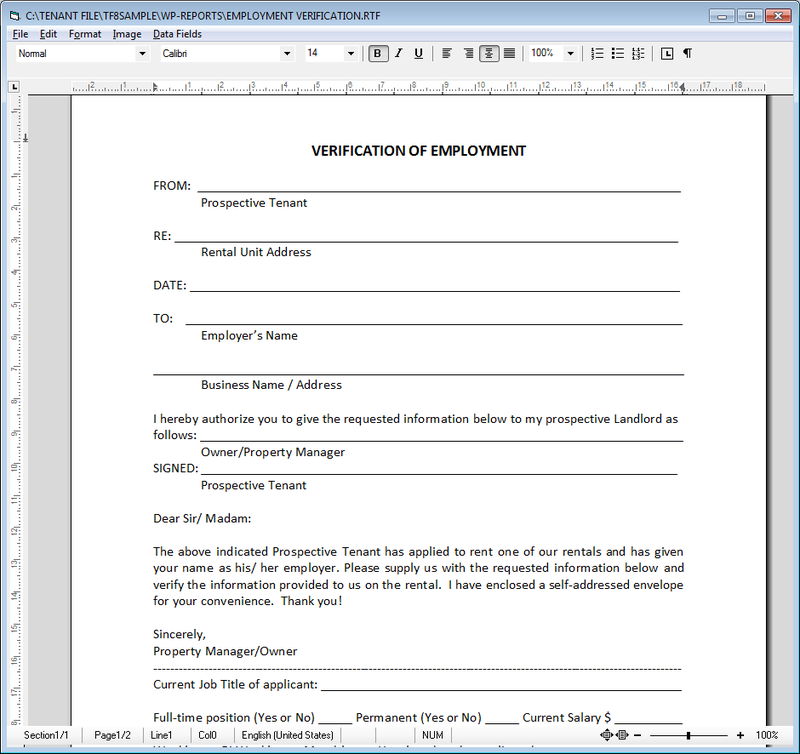 Forms to help you quickly and thoroughly verify information. Includes such forms as a Rental Application, Landlord Verification, Employment Verification, Bank Reference Verification, Cosigner Agreement, and much more! Valuable forms you need to efficiently manage your property. Includes forms such as a Sample Rental Agreement, Move In Checklist, Pet Agreement, Parking agreement, Lead Disclosure, Lease Extension, and more! Important notices, including a Returned Check Notice, Late Fee Notice, Pet Violation, Promissory Note, Collection Letter, and more! Plus, when used with the Tenant File software, you can insert Owner and Tenant information into your reports to create merge letters and personalized letters to your Owners or Tenants in seconds! You can print merge letters based on tenants that have a certain current balance, expired leases, and more! Take control of your paperwork. Get the forms you need now! 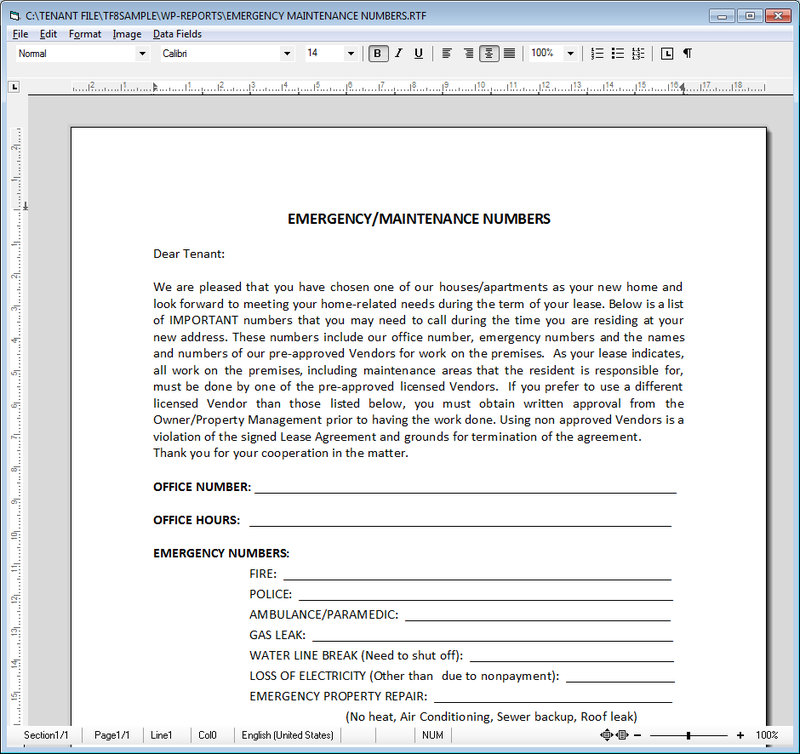 MAINTENANCE AND MANAGEMENT Forms you need to run your property management business. Includes valuable forms such as a Maintenance Guarantee, Full Inspection Report, Resident Grievance, Independent Contractor Agreement, Accident Report, Management Agreement, Power of Attorney and many more! Excellent forms to help manage and market your property. Includes letters such as a Notice of Rent Increase, Relet Agreement, Cleaning/Make Ready, End of Lease Notice, and a Rental Market Survey, plus more! 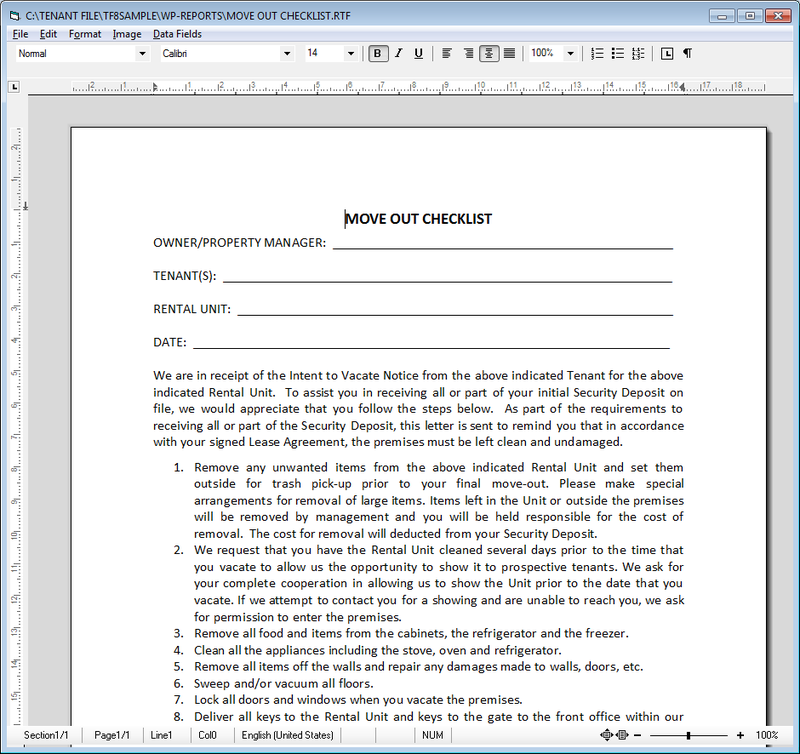 The Tenant File Word Processor is easy to use, time saving, and comes with over 100 property manager forms! The cost of the Word Processor is only $149.95.